If I was to rank the importance of my fishing gear, polarising sunglasses would fall into the "almost essential" category. Sure, they're not "critical". It is possible to catch fish without them. A good pair of sunnies, however, will help you catch a lot more fish no matter which style of fishing you're into. Not only that, they make boating activities much safer and they can protect your eyes from cancer-causing UV light. When it comes to fishing sunglasses, Mako are a market leader. The quality eyewear produced by this Australian-owned company has been available in this country for more than 25 years and there wouldn't be too many serious fishos who haven't at least heard of them. That's why I was as keen as anything to get my hands on a pair of Makos for review. My immediate need was for a pair of glasses to take on a DIY fishing and boating trip to the Kimberley region of Western Australia in the middle of last year. After consulting with Fishing World's Chris Yu, I settled on a pair of Barra 2 sunglasses. Having given them a thorough workout both during and since that trip, I'm pleased to report they were a perfect choice. The Barra 2 are polarising glasses that are said by the manufacturers to be popular amongst fishing tour operators. They have sleek, matte black, plastic frames with a 'wrap around' design, complemented by glass lenses. I chose grey lenses because they are said to be suitable for offshore fishing, driving and general use, but other colours are available for the Barra 2 frames. For example, anglers more interested in sight-fishing for trout might prefer the copper lenses. Right from the moment I first slapped the Barra 2s on my dial I found them comfortable to wear. I have previously owned sunglasses with glass lenses and found them noticeably heavy on my face. Not so the Barra 2: they’re as light as a feather. The arms provide a secure but comfortable grip above your ears and the glasses sit perfectly on your face with little or no light intruding around the sides. The glass lenses have also proved their worth in the scratch resisting department. After bumping and bouncing around in my boat and ute for several months, the Barra 2s show not a single mark. The grey polarising lenses were easy to look through for long periods of time, with no noticeable visual distortion. They do fog up a little if you put cold glasses on a hot and sweaty face, so it's best just to wear them all the time! Even if they do fog, once the temperature equilibrates you'll be good to go. 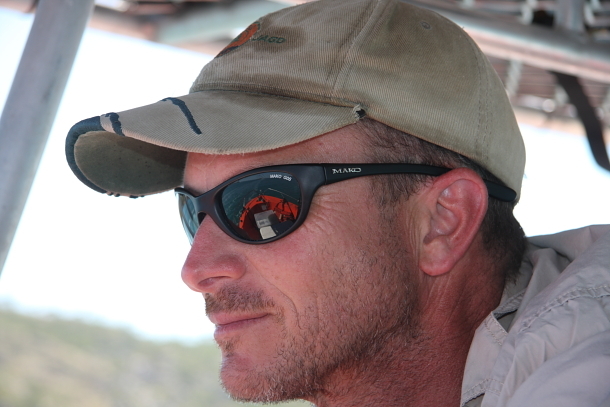 Overall I'd definitely recommend Mako sunnies as a great option for serious boaters and fishers. You can find more information about the Barra 2 glasses ,along with the rest of the extensive Mako range, HERE. The Mako Barra 2 sunglasses are comfortable and functional and will help you catch a lot more fish.